As I mentioned here, over the next few weeks, I'm going to be highlighting a few mom uniforms that work for me. In other words, go-to ready-made outfits that just work and are probably already hiding inside YOUR closet, waiting to be paired up. Disclaimer: I have zero credibility as a fashionista as I talk about HERE. Proceed with your own good judgment. I take no responsibility for your style mishaps. I will however, happily claim your successes. Me. My good intentions. This week. IMAGINE my hair is nicely done and my eyes can fully open because I am soooo rested and my four-month old is sleeping soundly. 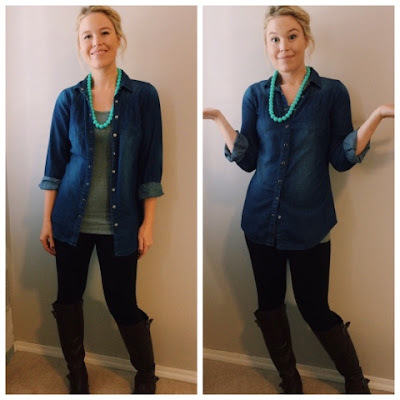 Let's talk about the good old button-down shirt. If you too are in your early thirties late twenties, you likely have a multitude of open or button-up cardigans in your closet that you're considering tossing. Don't. At least until you're done reading this. 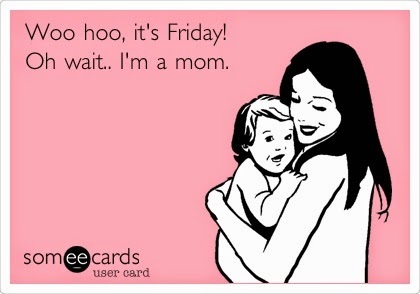 This one fits when I'm not breastfeeding. This one is great when I'm three months pregnant. This one is for when I'm at my perfect unicorn weight. This one looks good under the full moon. I'm here to tell you that it's time to haul out the button-downs and cardigans and try them all on. 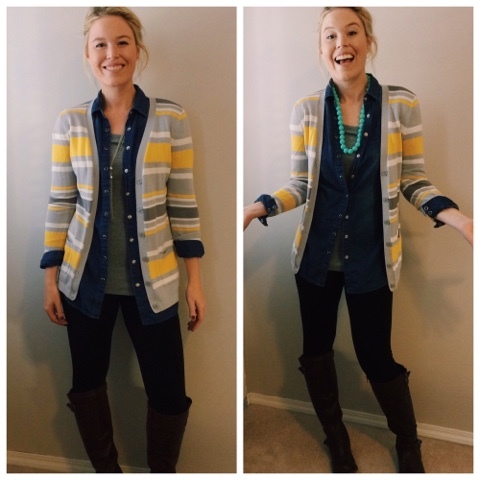 When you add a necklace or a scarf, or pair them up together, they MIGHT JUST WORK and you MIGHT JUST LOVE THEM again. Here are the combos I wore over the last week. TIP: Yes, jeans at Ardene's. Don't be intimidated by the fact that the clothing there is made for thirteen-year-olds. Just add three six sizes to what you usually wear, try them on and you've got yourself some comfy cheap economical pants. You've also probably got a chambray top kicking around somewhere. That just means denim. Now you sound fancy. Wear it open. Wear it closed. Roll up the sleeves or leave them down. It all works for a casual look. CHAMBRAY: Soya Concept Leggings: Costco Boots: Target Fancy teething necklace: Gift from a friend from Cravings in Saskatoon. I find chewing on it really helps me not yell at my kids... I think that's how it's supposed to work. Here are a few more combos I wear. Feel free to love them or hate them. I adore mint green and burgundy together. 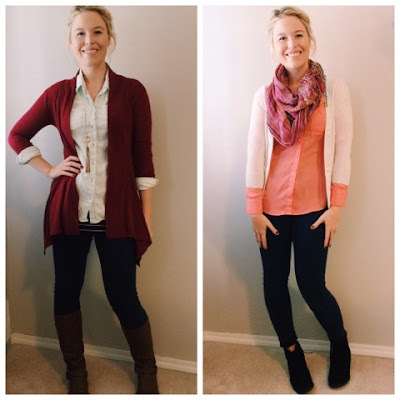 Does the scarf in the second picture match? Just kidding! I don't care. Play with patterns and colours. Button up (that would have looked good with a collar necklace) or leave your shirt open. Cardigan optional. Undershirt mandatory. These may seem random, but they all actually work as neutral tones. If you don't believe me, look at the photos again. 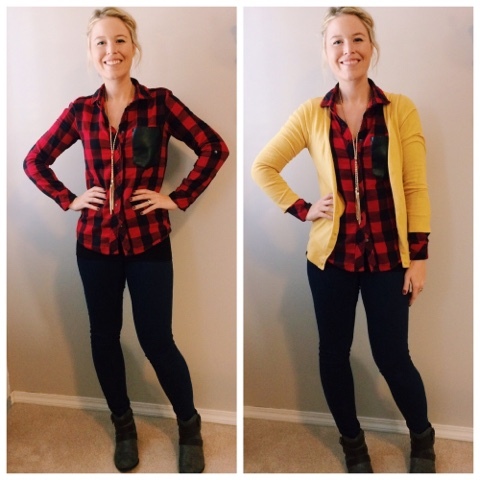 I would wear a yellow or cream cardigan with EVERY outfit in this post, burgundy with every one except the red plaid and forest green with all except the navy patterned shirt... maybe even that one. I'll think about it. Note: If you aren't comfortable wearing yellow against your face, you can still wear it as a layer. Another note: Sometimes adding a layer makes you look slimmer. Mind blown. Doesn't make sense one bit. Excuse me. I need to go have a nap now. All of the above? Night night. Toddler PTSD! I have a permanent twitch from this condition. bahahaha. You crack me up. Then Happy Friday! 😊 Hope your little lady is feeling better soon! 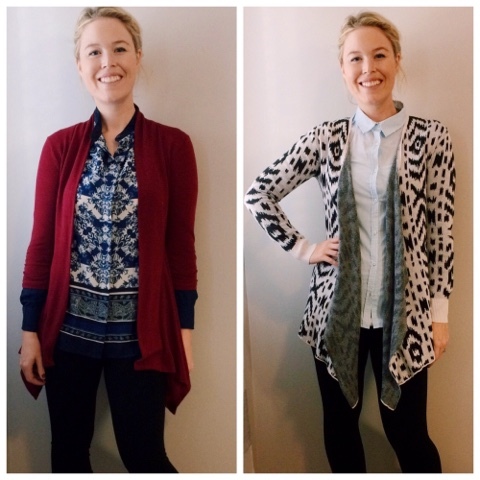 Love the long cardigans with button-downs, my closet is full of both! !